Lightened up chocolate cupcakes that taste even better than their more fatty competitor? Sign me up! 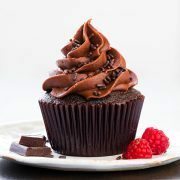 These cupcakes melt in your mouth! You honestly would never know that applesauce was added to lighten them up in place of butter or oil. And the penuche frosting, where do I begin? Let’s just say this stuff is worth gold to me =). If you have never tried penuche, it’s basically an insanely delicious, caramel like brown sugar fudge, and here it is in frosting form. 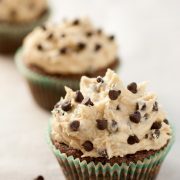 The cupcake recipe is my own and the frosting recipe was adapted from allrecipes.com, thank you allrecipes love that site! 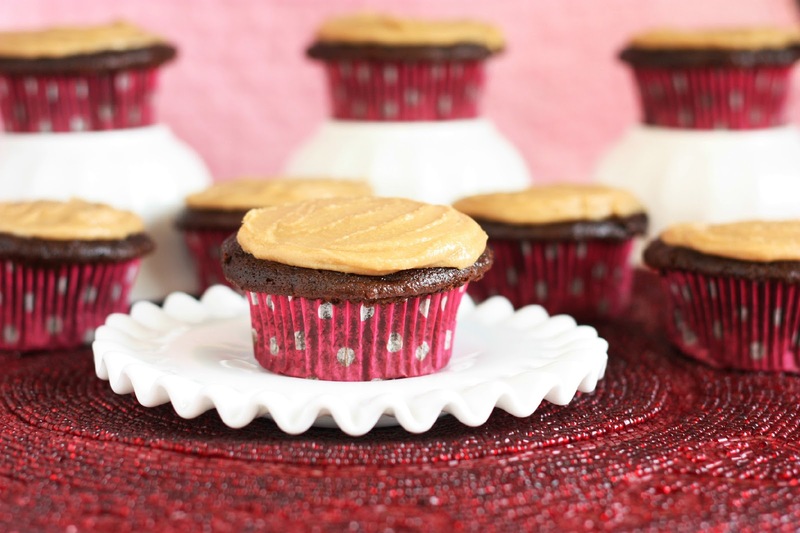 Deliciously soft and moist chocolate cupcakes with a tempting, sweet penuche frosting! Preheat oven to 350 degrees. Fill two muffin tins with paper liners and butter top of muffin tin. In a large mixing bowl whisk together flour, sugar, cocoa, baking powder, baking soda and salt. Add in eggs, sour cream, applesauce, melted butter, buttermilk, molasses and vanilla and mix until blended. Stir in hot water and mix with an electric mixer on medium speed for 2 minutes. Pour about 1/4 cup mixture (or fill cups 3/4 full) into 24 paper lined muffin cups (there should be just a bit left over) and bake for 17-18 minutes until a toothpick inserted into center comes out with a few moist crumbs attached. 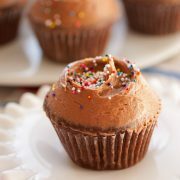 Allow cupcakes to cool before frosting. Melt butter in a medium saucepan over medium heat. Whisk in brown sugar and salt and bring mixture just to a boil, reduce heat and simmer for 2 minutes, stirring constantly. Stir in half-and-half and bring mixture just to a boil, stirring constantly. Remove mixture from heat and stir in vanilla. Allow mixture to cool to warm (original recipe states "lukewarm" but I found warm worked better) then beat in powdered sugar. Add hot water as needed to thin frosting out 1 tablespoon at a time. Immediately spread frosting over cooled cake/cupcakes before it sets. *I usually only have light brown sugar on hand so I just add 1 tsp molasses to this recipe along with the light brown sugar (rather than using dark brown).